(MissionNewswire) Salesian missionaries with Don Bosco Technical High School in Monrovia, Liberia’s capital city, have launched a new vocational training course for electro-technicians. There is an afternoon class available to high school students which compliments their current educational path as well as a morning class for young workers to help them obtain certification to improve their options in the workforce. The new electro-technician training is part of an initiative that includes the renovation of an existing space in the Don Bosco Technical High School to transform it into a workshop. The initiative aims to respond to the needs of the labor market while ensuring youth have access to vocational and technical training that aids them in finding long-term stable work. The electro-technician course will be opened each year to 90 high school students and 30 uncertified electricians. Liberia is still recovering from a civil war and the deadly Ebola epidemic that affected 10,678 people with 4,810 reported deaths, according to the World Health Organization. After the Ebola crisis, Salesian missionaries worked to unite vulnerable Ebola orphans in Liberia with relatives or with educational programs to provide much needed ongoing care. Other Salesian programs provide food, medical care and education to Ebola orphans and former child soldiers. Salesian missionaries continue working to help poor youth and their families escape poverty in the country. An estimated 64 percent of Liberians live below the poverty line and 1.3 million live in extreme poverty, out of a population of 4.6 million, according to World Food Programme. Food security is also affecting 41 percent of the population making chronic malnutrition high. Whether working to rehabilitate former child soldiers or assist young women in overcoming barriers to education, Salesian programs in Liberia are providing opportunities for youth to live up to their potential through both academic and social programs. Salesian volunteer programs and Catholic schools have helped more than 2,300 students and their families. 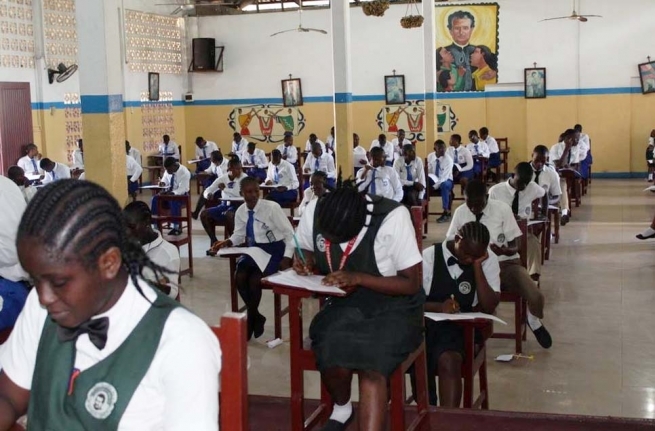 Also in Monrovia, Salesian sisters operate the Mary Help of Christians School which provides a foundation of education and support for young students who would otherwise have limited opportunities. The school started in 1993 and serves just over 560 students. It includes a feeding program which serves over 100 of its students and ensures that those in need receive a nutritious meal each day. In addition, Salesian missionaries operate the Don Bosco Youth Center in Monrovia which provides support and programming for students and offers after school activities from 4 to 6 p.m. The center gives former child soldiers and other young people the opportunity to experience some of the joys of childhood. Youth can participate in recreational activities and sports each day ranging from chess to soccer. Some participate in a cultural troupe where they sing, dance, act, practice African acrobatics and even perform at local functions. In addition to recreational opportunities, youth have access to vocational training and academic courses at the center. It also offers a women’s development program for participants to learn self-reliance.